A weakening cold front will bring rain and embedded thunderstorms today. Near time of posting, the swath of rain was fairly impressive and is sure to bring a relief to a recent slowdown in rain amounts. Nothing like a nice rainy day now and then. Some storms do seem to be popping up ahead and in the complex. These should be brief with a few rumbles of thunder here and there. Swath of showers and thunderstorms will move through Michigan this afternoon and early evening. Meanwhile, a stronger front with much cooler air will develop in the Midwest and track eastward on Tuesday. With this stronger front come stronger thunderstorm parameters. The usual players will be there. Lift will be provided by the cold front, moisture is already in place with high dew-points into the 60-70 range, and the atmosphere will have instability as CAPE values approach 3000 J/KG. Additional parameters to look at include wind shear; which is how the wind changes(speed/direction/both) from the Earth’s surface to 6 or so kilometers in the atmosphere, and occasionally the LI or Lifted Index(another indicator of instability); comparing a theoretical air parcel’s temperature to the environment temperature surrounding it. The Storm Prediction Center is calling for a few solutions to this event, mainly around a few Mesoscale Convective Systems. These will birth in the Midwest and track eastward with the front. Main threat will be some strong winds and large hail with these systems. Tornadoes can be a threat as well, generally during initial discrete development, but not limited to. Temperatures will be in the mid to upper 80s through Wednesday. Once these fronts pass early week, Thursday and Friday will be cooler before temperatures rebound into the 80s for the weekend. Stay tuned to the Facebook page for tiny updates and cool weather stuff from the social media world. Thanks for the read, feel free to comment/ask questions! A warm front passing through the region triggered some morning/early afternoon thunderstorms across lower Michigan on Tuesday. These storms quickly organized into some linear squall lines with mainly heavy rain, wind, and frequent lightning. Heading into the early evening hours, more discrete storms emerged and tracked eastward. Like flicking a light switch, as soon as these storms crossed an invisible line just east of US-127, the storms started to exhibit rotation on radar and weather spotters on the ground confirmed these cases. I’d like to look into this case further as what triggered these storms to rotate all of a sudden, as it was visible in at least 2 of these storms. National Weather Service survey crews from Detroit/Pontiac had their work cut out for them early Wednesday as they investigated damage across Shiawassee and Genesee counties. Tornado findings by NWS DTX. More information found by the survey crews can be found here, as well as map/track overlays with EF scale rating. Interestingly enough, no watches were issued for SE Michigan Tuesday. The only Michigan inclusive watch was a Severe Thunderstorm Watch issued in the extreme SW corner for a developing squall line with severe rated winds coming out of the Chicago area. Watches are issued by the Storm Prediction Center out of Norman, OK. Warnings are the most important for public safety, but dangerous weather lead time provided by watches is always good to have. I typically update my Facebook page frequently, as well as twitter, however the best ways to keep updated about storms in your area is to check out local news stations and NOAA Weather Radio. If you are not in any immediate danger, looking up the hashtag #miwx on twitter will also prove fruitful for Michigan weather sightings and damage. This can be adjusted by state by just changing the two letter abbreviation. County police/fire scanners are also a great option, these are usually available online. The past few weeks have proved a questionable spring. Temps failing to reach 60, frozen precipitation, a sun missing in action….can’t rely on Midwest weather to be on a consistent time-table. At least two of these mentioned will be absent this week. Perhaps the most justifying, rain and warmer weather will arrive. Rain is no stranger so far this Spring. A nice dose of 2+ inches across the region last week has us well above normal for the year(yellow line). Rain is again in the forecast for the week. Rainmakers will appear on Monday/Monday Night, as well as heading into Thursday when conditions may threaten for some severe weather along the Michigan/Ohio border. This will need to be looked at as the week progresses. Through next Saturday, a good two inches of rain could fall in already saturated areas, so flooding will again be possible. 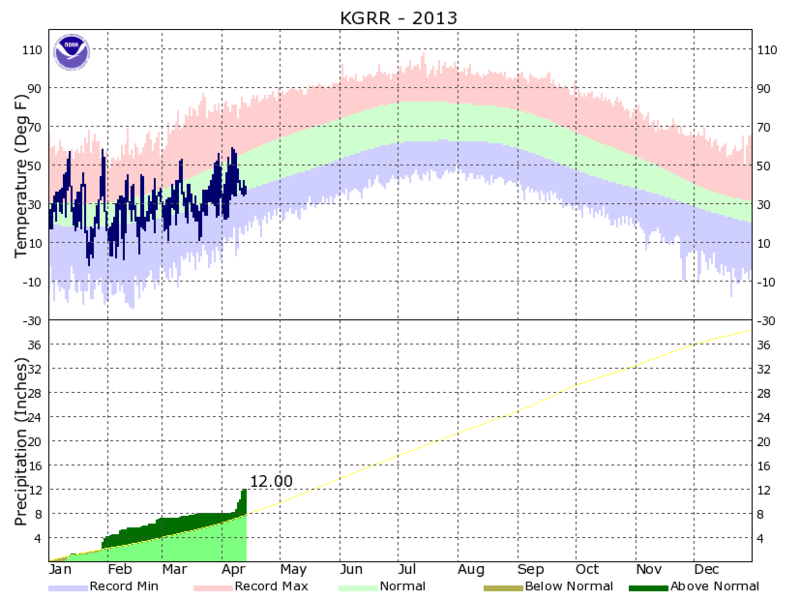 Grand Rapids climate graph of 2013 so far. At least the precipitation will be in liquid form. Sleet was reported in southern Michigan on Sunday, and Central Michigan University campus had a delayed start on Friday thanks to a sleet/freezing rain combination Thursday evening. That event may have been worse had the days leading up to the storm not been above freezing. Ground warmth did a good job at fighting off ice accumulation on surfaces. Trees don’t harbor this ability as well, and ice on the branches was evident while out and about on Friday. Warm weather will filter into the region with our rain producing pattern. A ridge will amplify over the Midwest, and the warm air will be allowed to travel north. However, with that transport is the mentioned moisture. Temperatures will start in the lower 60s for Monday, and top out in the mid/upper 60s on Thursday. Once we have our stormy day on Thursday, the associated cold front and trough will bring in some cooler spring air, but still above freezing during the day. Yay progress! Hang in there! As daylight becomes longer and temperatures get warmer, we move into our yearly cycle of weather changes. Snowstorms become rain and thunderstorms, and there is plenty to take note of as we head into another year of severe weather. As produced by National Weather Service offices around Michigan, April 7-13 is Severe Weather Awareness week! Earlier in March, I was remembering the unique events that launched Spring 2012 into a craze. We had record temps into the 80s, and multiple tornadoes tear across eastern Michigan. It was a very interesting start to the year, and it kept you on your toes for forecasting and figuring out just what the heck is going on up there! While Spring 2013 is moving in like a lamb, that lion could be waiting right around the corner, and being prepared is a priority. This is the single most valuable thing you can have for warning during a stormy day! We absorb weather through many sources these days; internet, TV, radio, word of mouth. When the winds start brewing and the power goes out, many of these reliable sources are cut down. Even if you have a backup generator, chances are your media services(internet/cable TV) will not be powered in your area. Having a battery-powered weather radio can keep you up to the minute warnings and weather information. The warning signal usually beats web updates by a few minutes as well. Weather Radios are also a hero at night if the house is asleep and dangerous weather is near. Keep them charged with batteries nearby! This goes along great with the weather radio. While forecasters may get as specific as calling out road names and cities where the storms are near, you should also know the County names surrounding your location. Storms typically move West to East, sometimes SW to NE, sometimes NW to SE. Bottom line, know where you are relative to where the storm is. If you think a dangerous storm is going to miss you, do not take it for granted. Supercell thunderstorms are known to waver on path, and sometimes can change direction. Be prepared for anything! These are great chances to learn about weather a little more in detail, and refined to severe weather scenarios. They are free, and usually run by a few forecasters from your local NWS office. That means they are run by the folks that track and watch for storms on a daily basis and know what to look for. You will go over everything from how to report weather threats to authorities, to determining if that ominous dark cloud is a wall cloud or shelf cloud(important!). Usually there is a great Spotter’s Field Guide that is handed out for quick reference, there is an online PDF version available here. Once you have learned this material, you become a very valuable resource to forecasting as you are an eye witness to the weather in your area. As useful as that is, always make sure your safety is first! NEVER put yourself in danger to get a report. As mentioned previously, knowing the difference between clouds can mean loads for the weather to expect. Low flying scud could prompt you to call it a wall cloud(precursor to tornadoes), but is that cloud rotating as well? Is is attached to the base of cloud above it? How about those shelf clouds that take up the entire horizon? Much of this is detailed in the Skywarn classes, but this is something that can help you out in a fix, and impress others. 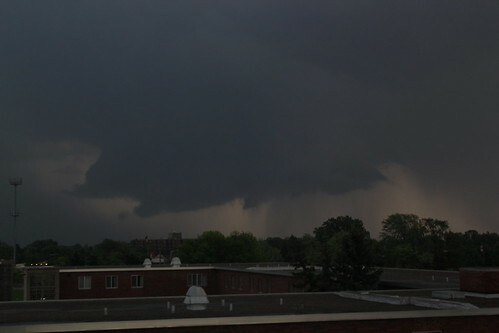 Example of a wall cloud just SE of CMU campus back in May 2011. “Yea, that storm is way far from my house, I don’t need to pay attention.” Always take note of Watches/Warnings. Along those lines, know the difference between a Watch and a Warning. Severe Thunderstorm Watches and Tornado Watches mean conditions in the atmosphere are favorable for that type of weather to develop, so be ready for storms later in the day, or within the next couple hours. Severe Thunderstorm Warnings and Tornado Warnings mean a severe storm has been spotted/identified, and is tracking along the specified path. Take appropriate action immediately if you are in the track of the storm. A disclaimer I must make about the blog; Greg’s Weather Blog is not a good source for immediate severe weather forecasting! Please do not rely on this page for up to the minute information on storms! Head to http://www.weather.gov for that, and type in your Zip Code to find yourself quickly and any Watches/Warnings that are in effect. Enter E-mail, receive Greg's Weather. Taa-daa!